During the last few months we have seen two mega mergers in the gold sector. The Barrick Gold and Randgold merger was completed during the first week of January. While the Newmont and Goldcorp merger was announced only days thereafter. The much-needed consolidation could stir up a lot of activity in its aftermath. The shedding or repositioning of projects, shareholdings, royalties and streams could have a tremendous impact on the junior mining industry. One region in particular could see a lot of attention: NEVADA. Earlier in January, we travelled to Las Vegas to meet up with Corvus Gold and take a look at their North Bullfrog and Motherlode projects in the Walker Lane Trend just outside of Beatty. We were accompanied by Quentin Mai, VP Corporate Development and Ryan Ko, responsible for Investor Relations. Before diving into the projects and our observations during a long day on the road, lets quickly take a look at the company itself. Corvus Gold is listed on the TSX mainboard (ticker: KOR) and currently trades at a price of C$2.26 and a market cap of C$251mn at the time of writing. The company has 110.3mn shares outstanding and no warrants. Major shareholders include AngloGold Ashanti (19.9%), Toqueville Asset Management out of New York holds 17.6% and van Eck Global also based in the Big Apple, sits on 9.6% of the outstanding shares. CEO Jeff Pontius is the largest single shareholder with 4mn shares and about 2mn options. The Corvus stock is coming off a high of C$3.39 at the beginning of October. Since the share had a pretty good run up in the past 12 months – it started 2018 at C$1.65 – we can assume that tax loss selling was not the primary reason for the decline in recent months. We have picked up in conversations that in fact Goldcorp, apparently in anticipation of the merger with Newmont, has started to come off its 1mn share position which it received when it sold the Motherlode deposit to Corvus in June of 2017. Once Newmont got involved the selling was stopped and we have been told that there is currently no sell order from Newmont in the market while they are re-evaluating their holdings. The soon to be largest gold producer in the world – expected annual gold production of 6 to 7mn ounces - apparently still holds about 300,000 shares. On top of that, the new Newmont will hold a 1% NSR on Motherlode, giving the major a small foothold in a district that screams for consolidation of projects to revive it. Corvus Gold owns and controls a total land package of 123km² in the Greater Bullfrog area within the Walker Lane Trend. The area around Beatty, a small town tourists only stop in to fuel up and buy candy on their way to Death Valley, has seen gold mining going back to the 1850s. Barrick used to run and operate the Bullfrog mine just outside of town until 1991. Corvus has been active in the area since the spin-out from International Tower Hills in August of 2010. But only in recent months and especially since the acquisition of the Motherlode project in 2017, the investment community started taking proper notice. The acquisition of Northern Empire by Coeur Mining in the summer of 2018 fueled additional interest in the area but also in the state of Nevada. Besides Gold Standard Ventures we currently cannot think of any other projects this far advanced and positioned as potential takeover targets. To add to the speculation and tension in the Greater Bullfrog area, AngloGold Ashanti is very eager to stay a 19.9% shareholder of Corvus. Only days before the Christmas break, the major and Corvus Gold arranged a non-brokered private placement for 800,000 shares at C$2.60 that lifted the holding of the Johannesburg based gold major back to the maximum before having to make a public offer for the company. AngloGold Ashanti is currently drill testing their Silicon project just north of Motherlode and while on site at Motherlode we could see one of their drills in the distance. Rumor and bar chatter have it that Anglo has been hitting high sulfidation epithermal veins from a 1,000ft down. According to one group more familiar with the drilling, there was visible gold in the core as well. Based on these assumptions Anglo could have hit similar geology than Corvus encountered at their own Yellow Jacket project to the northwest of Silicon. Words of a “substantial new discovery” are making the rounds in the small town two hours northwest of Las Vegas. As Anglo itself is very tight lipped, the whole Corvus exploration team is anxiously awaiting an update to the website of Anglo to get more accurate information on the activity north and east of their own assets. In the meantime, Corvus is advancing their own projects and working on improving their most recently published study results. From the get-go in 2010, CEO Jeff Pontius and his team made it clear that they are not interested in putting the project in production. Hence the plan will be to potentially release an updated PEA by the summer, if required. Pontius has no interest in spending the money and doing the work on a Pre-Feasibility study or even fully-fledged bankable feasibility study. “The potential buyer will want to do his own studies anyway”, informs us Ryan Ko while standing in the single-wide trailer doubling as the regional office for Corvus outside of town. 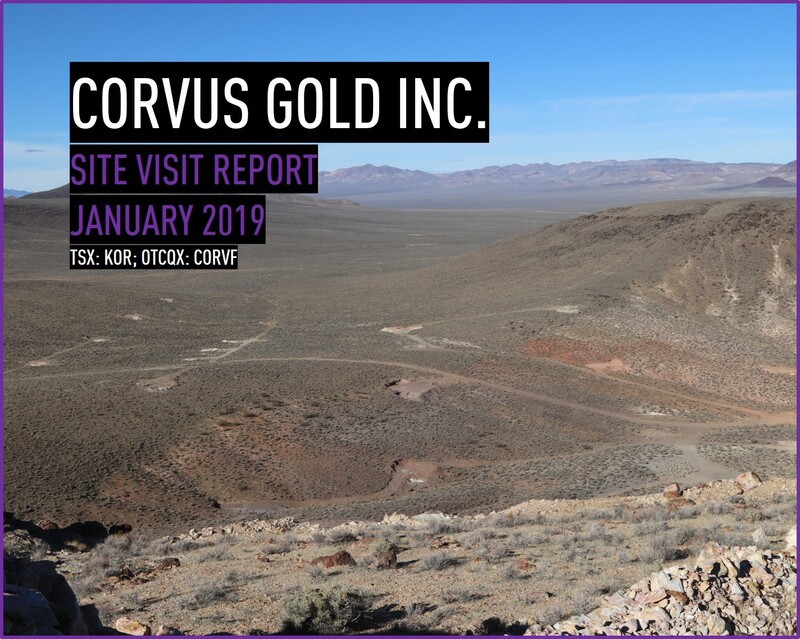 Corvus has identified three key areas it wants to focus on in 2019 to improve upon their PEA and resource estimates. The goal is to show the market the potential that the mine life can be extended and that the combined projects can produce 350.000 ounces of gold per year for at least 10 years. The current PEA has only the first four years of production pegged at that rate. 1) Drilling at Motherlode towards the northwest, currently Corvus is finishing up drilling of hole 105 that has been drilled to over 1,500ft. In total, 17,000m have been budgeted in the area. If market conditions improve – access to meaningful financing and a potentially higher gold price – Corvus will consider drill testing their newly identified Jasperoid Wash target. 2) Improvement of recoveries. Led by COO Carl Brechtel, Corvus is undertaking testing to improve the recoveries of the mostly sulfidic ore. The recent PEA left roughly 1mn ounces of gold behind and an improvement of the recoveries by at least 20% would immediately add 200,000 to the mine plan and therefore the life of mine and run rate. 3) Entering of a layback agreement with Coeur. We regard this point actually as the most important catalyst for Corvus and the whole area in the near future. It would mean that Coeur is open for business and is willing to find or be part of a district solution. As mentioned above, Coeur acquired the adjacent Sterling project through the acquisition of Northern Empire in 2018 for 90mn US-Dollar. The property line goes right through the pit wall of the existing Motherlode pit. Talking to industry experts we learned that Coeur is quite interested in joint-venturing with Corvus. Only about 18 months ago, Coeur actually invested into Corvus Gold at a level of 80cents and acquired 6mn shares. After failing to reach a joint-venture agreement, Coeur started selling its position in the market and acquired Northern Empire of which Coeur owned 13% prior to the transaction. At the same time the stock of Corvus was trading significantly over the original purchase price. Fortunately, Corvus was able to find a home for the shares. Van Eck stepped up and acquired two million shares while the rest was absorbed by the market. Despite the rumor that Coeur is looking to sell Sterling after only owning it for less than a year, the Chicago-based miner is actively working in the „Silver State”. The mid-tier gold and silver producer is planning a decently sized exploration program and apparently plans to deploy 3 RC and 1 core rig in the area. According to Mark Reischmann, Corvus Gold’s VP of Exploration, the lines of communication are open between both groups and data is being shared freely. Mark did a great job showing us around the property and putting up with our questions. 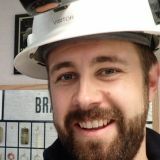 He is looking back onto 25 years of experience in the Greater Bullfrog area as he worked for Barrick in the past and previously drilled North Bullfrog in the 90s. Coming back to the layback agreement. The implications for Corvus’s mine plan could be significant. Being able to push back the benches of the current open pit would mean that the mine would get access to mineralized ore that was not yet included in any studies. On top of the metallurgical improvements, Corvus could quickly add at least 200,000 ounces to the current mine plan. Corvus Gold holds another potentially game winning ace up its sleeve: water rights. Water could ultimately be the deciding factor for any potential suitor to acquire Corvus when consolidating the area. Following the site visit we have done some more research on this topic. Corvus was smart and started acquiring water rights just in time. By acquiring a farm in the Sarcobatus Flat (Basin 146) they secured access to 1,600 acre-feet of water. Just as important, when acquiring the Motherlode deposit from Goldcorp in 2017, Corvus secured two additional wells in the region bringing up the total number of wells to three. Not all of them it has access to yet, but a plan of operations has been filed with the Bureau of Land Management (BLM) to construct the necessary roads. The town of Beatty is surrounded by several administrative groundwater basins. Basins 146 to the northwest, 228 to the northeast, 230 to the south as well as 229 to the southeast. Basins 146, most of 228 and 230 are designated basins, meaning they are tapped out and no new water rights are available. Basin 229 – the area where Coeur owns the Sterling project - still has capacity but speaking to a Coeur executive on the streets of Vancouver the other day, there is only 250 acre-feet of water left – not enough for a mining operation. Coeur and AngloGold are already buying their water from Corvus. The last point we want to make is that we are of the strong believe that the area will need to be consolidated. The potential of region sits somewhere around 10mn ounces of Gold. And depending on the results that AngloGold Ashanti is achieving at Silicon, we have our money on the South Africans. A massive new discovery could trigger a mad “gold rush” in the district and see share prices explode. But then again, it usually takes the majors years to a) drill out a project to a satisfactory leven and b) make up their minds regarding potential acquisitions. Coeur in the meantime is considering a bipartisan solution of AngloGold Ashanti building a mill while they go ahead and build their own heap leaching operation to process their oxide material. Corvus could be the extra kicker that makes each of their own projects stand-alone projects. However, common sense dictates there to be one operation. In summary, the site visit helped us understand where Corvus is at with its own projects, its plans for the next 6 to 12 months, and impact of the above-mentioned catalysts. Depending on how long the majors take to sort out their own affairs, we suspect that the second half of 2019 could see Beatty blaze with activity. Corvus Gold is paying NorthStar Communications GmbH, a company associated with the CEO of Oreninc, for blogging services. This article will also be translated into German and published via Rohstoffbrief.com and Investor-Magazin.de and other channels picking up the content of these pages.